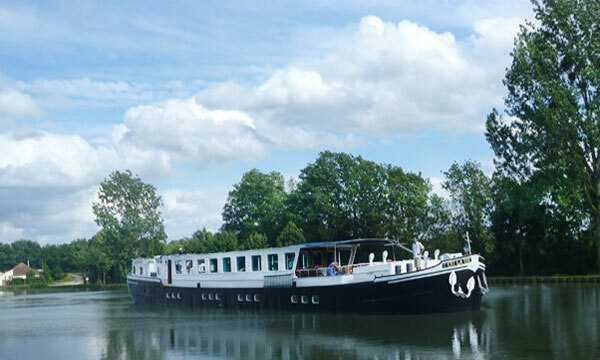 Barge Lady Cruises is delighted to introduce the newest lifestyle concept in French barge cruising, the 6 star-rated Grand Cru – a floating boutique hotel inspired by the sophisticated services and amenities expected by today’s discerning traveler. Cosmopolitan cruisers will enjoy a spa pool on deck, demonstration kitchen, upstairs powder room, and a sommelier-selected onboard wine cellar. Grand Cru debuted in April 2018, offering six night/seven day journeys on a route featuring “The Best of Burgundy’s Best.” Exclusive to the Grand’s Cru’s drinking and dining program, guests will enjoy pours of Grand Cru wines with every lunch and dinner. Selected from France’s esteemed wine regions, these Grand Cru samplings pair perfectly with the Chef-driven gourmet cuisine. Other superior libations will be served as well, such as craft cocktails made with the “crème de la crème” of regionally-sourced spirits and liqueurs. While sailing on the Grand Cru, Burgundy’s cultural treasures are on offer every day, ensuring unparalleled access to the local flavors and lively personalities of the region. Escorted excursions reveal the area’s most treasured resource: here, the pampered grapes of Burgundy’s Cote d’Or are on vivid display. Grand Cru’s guests will meet the entrepreneurs behind Burgundy’s wine production thanks to a series of vineyard visits and private tastings. 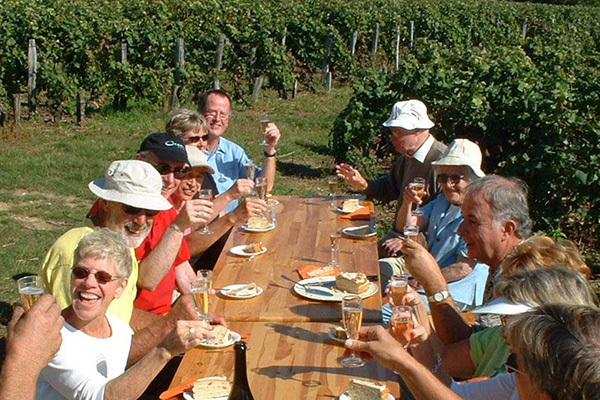 “The Best of Burgundy’s Best” is further enjoyed during excursions to family-owned chateaux and gourmet food markets, as well as guided tours in the towns of Dijon and Beaune. Although cruising deep within France’s iconic wine country on a beautifully preserved antique canal system, the Grand Cru’s eye-catching modern design effortlessly reflects the clean lines and open spaces of contemporary living. Four generously-sized cabins hold up to eight guests in beautifully-appointed staterooms, while the comfortable furniture throughout the spacious salon and expansive deck encourages hours of casual socializing. Active passengers are encouraged to explore the route’s charming canal side villages by bicycle or on foot. 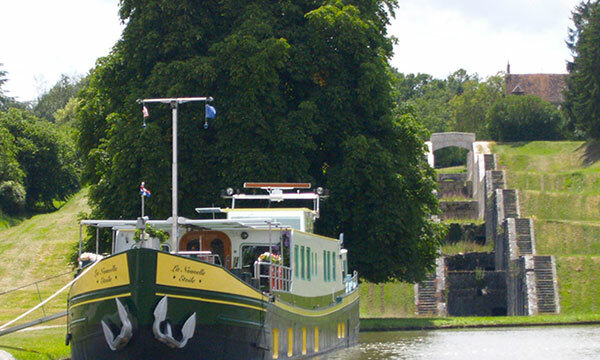 Experience the best of France, the best of canal cruising, and above all, your best self aboard Grand Cru! In the afternoon, you will be met by a crew member of the Grand Cru at the designated meeting point. 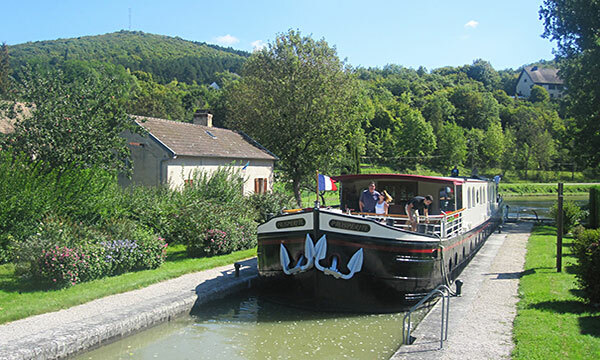 Relax as you are chauffeured to the barge, moored in the petite village of Pontailler-sur-Saone. A traditional champagne welcome and introduction to the crew awaits you, before your first gourmet dinner. Perhaps enjoy a glass of Grand Cru wine after dinner while lounging in the hot tub. This morning, your Tour Guide presents an insider’s visit to Chateau d’Arcelot, the first neoclassical castle of Burgundy, where you will be welcomed by the castle's owner, Madame la Comtesse de Loisy. After a tasting of locally produced gourmet specialties, return to Grand Cru for an afternoon cruise, admiring the rustic scenery gliding by. Relax on deck with a glass of wine and a good book, or explore the towpath on foot or by bicycle. Tonight enjoy socializing over cocktails and canapes before Chef serves a grand dinner. The journey continues this morning with a leisurely cruise through Burgundy's pastoral countryside. Upon mooring, your Tour Guide escorts you to the charming town of Beaune, the region's wine capital, for a guided visit to the Hospice de Beaune, a preserved Medieval hospital built in the 15th century. Afterwards, browse the shops and galleries lining the pedestrian area, or enjoy a coffee in the town square. Return to the Grand Cru and explore the towpath's flora and fauna by bicycle or on foot before Chef presents tonight's gourmet dinner. Relax in the hot tub, join Chef in the open kitchen, or explore the towpath with a bicycle ride or brisk stroll during a lazy morning cruise. This afternoon, explore the historic riverside town of Chalon-sur-Saone, where the bustling Place Saint-Vincent is lined with boutiques, galleries, and cafes. Awaken your senses during a visit to an artisanal chocolate shop and watch chocolatiers master their craft. Sample and savor premium chocolates before returning to the barge where canapes and cocktails await, followed by another gourmet dinner. Begin with a morning cruise towards Chagny, the home of Michelin 3* rated Maison Lameloise. A highlight of the Grand Cru's culinary experiences, enjoy luncheon ashore in this luxurious venue, recently voted one of the world’s best restaurants. Then discover the hilltop chateau-fortress of Chateau de la Rochepot, a 12th-century feudal castle of neo-Gothic-Burgundian style. Turrets galore and a rooftop covered with colorful local tiles beckon for exploration. Back onboard, enjoy another evening of drinks and dinner. A leisurely cruise begins the day's adventures. Join Chef in the open kitchen for an informal cooking demonstration, or explore the towpath with a bicycle ride or on foot. This afternoon, your Tour Guide escorts you to the cellars the prestigious Chateau de Chassagne Montrachet for a private winetasting. Known for high quality and complex vintages, these exceptional elixirs reveal the intricate tastes of Burgundy's terrior. Then it’s back to Grand Cru where Chef presents tonight's Farewell Feast, ending your cruise in style. Please note: this is a sample itinerary which may be subject to change depending on local conditions. Cruise will run in reverse direction on opposite weeks. In the afternoon, you will be met by a crew member of the Grand Cru at the designated meeting point. From here, relax as you are chauffeured to the barge, moored in the village of Dole. A traditional champagne welcome and introduction to the crew awaits you, before your first gourmet dinner aboard. Perhaps enjoy a glass of Grand Cru wine after dinner while lounging under the stars in the hot tub. A morning cruise is the perfect time to explore by bicycle or on foot. After lunch, golfers play 9 holes at Val D’Amour, with its unique setting at the confluence of two rivers. The non-golfers visit Clos de Vougeot, where Cistercian monks made wine in the 12th century. The ancient Clos now serves as the headquarters of the revered wine society Chevaliers du Tastevin. Explore the presses from which these iconic wines were first produced; a tasting of local vintages follows. Everyone is reunited on board for cocktails and dinner. The town of Dijon offers a pleasurable assault of the senses. "Les Halles”, the covered food market, presents colorful produce; jars of mustard are displayed in boutiques; and public spaces beckon with greenery and scenery. Shop, sip, and stroll through this charming town brimming with authentic French life. Your Tour Guide returns you to the barge in time for a relaxing afternoon of cocktails and cruising. 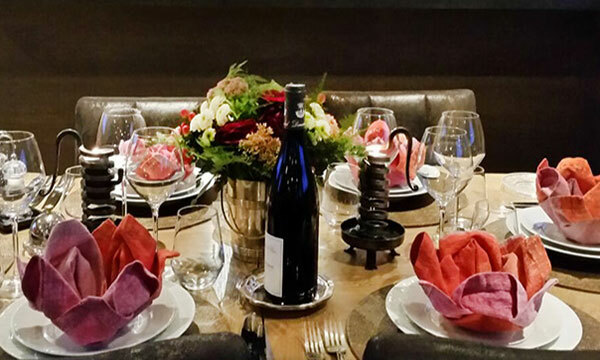 Complete the day with a gourmet dinner -- paired, of course, with Grand Cru wines. 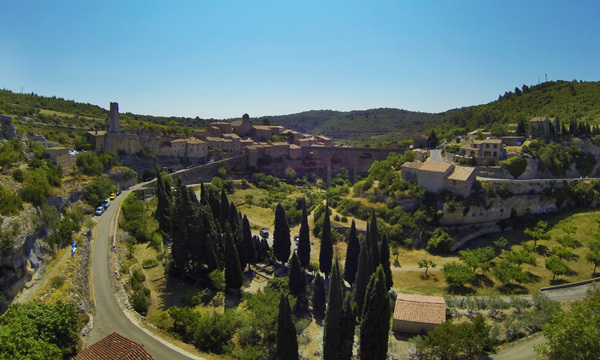 Past and Present Meet: Medieval Fortress + Michelin 3-star Lunch! A leisurely cruise begins the day. Upon arrival, you are escorted to the Chateau de Rully, a preserved medieval fortress. Complete the tour with samples of the estate's boutique wines. Then it is on to a special lunch ashore at Lameloise, a Michelin 3-star rated restaurant, recently voted as one of the world’s best. Return to the barge and enjoy an afternoon cycling, walking, or lazing in the hot tub. Tonight, Chef serves another gourmet dinner. Enjoy a scenic cruise this morning to our beautiful riverside mooring. After lunch, the golfers will head to Golf de Levernois Beaune for an 18 hole round in the heart of the wine country. The non-golfers will explore the charming town of Beaune, the region's wine capital, for a guided visit to the Hospice de Beaune, a preserved Medieval hospital built in the 15th century. Afterwards, browse the shops and galleries in the pedestrian area, or enjoy a coffee in the town square. Everyone returns to Grand Cru for another gourmet dinner on board. Relax on the deck with a cup of coffee during this morning's final cruise or traverse the towpath by bicycle or on foot. After lunch, golfers will enjoy an 18 hole round at Chateau D’Avoise, set in a pristine landscape of greenery and lakes. Meanwhile, the non-golfers have a private wine tasting at Chassagne Montrachet and Puligny Montrachet, which are among the most recognized and prestigious appellations in Burgundy. Back on board, enjoy canapes, Grand Cru wines, and a celebratory Captain’s Dinner, culminating the cruise in style. Please note: Tee times will be pre-booked and transfers between the barge and the courses provided. Golfers will pay directly to the courses for greens fees, club rental, and golf cart rental, as well as all personal expenses incurred. This is a sample itinerary which may change depending on the availability of the individual courses and will run in the opposite direction every other week.